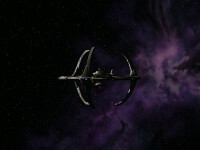 Built by Bajoran slave labor as an ore processing center during the Cardassian Occupation, Deep Space Nine eventually becomes one of the most important posts in the galaxy. 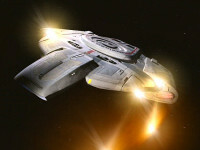 First Seen: "The Search, Part I"
Built with the intention to combat The Borg, The Defiant is Starfleet's first warship; inspired to be more powerful and agile than any other ship in the fleet. Long-range shuttlecrafts designed for diverse deep space missions. 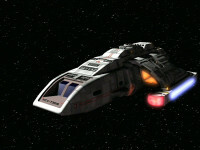 Three are assigned to Deep Space Nine at any given time and, up until arrival of The Defiant, they are the primary means of transportation for station personnel.